Availability: Usually ships in 4-8 weeks. Available in Large Quantity Only. Accepting orders of 500 boxes or more. Call for Special Bulk Pricing. These striking Mexican blown glass chili pepper ornaments are a perfect way to spice up your Christmas décor this holiday season. 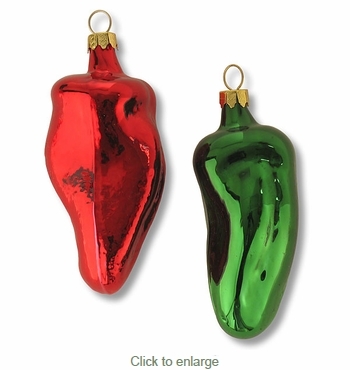 Our glass chili ornaments are all handcrafted by glass artists in Mexico and make a perfect traditional southwest Christmas gift for your friends and family. As with all of our hand crafted folk art items, expect some variation in size and color with our hand-blown glass ornaments. Small Painted Tin Cactus Ornaments - Per Doz.